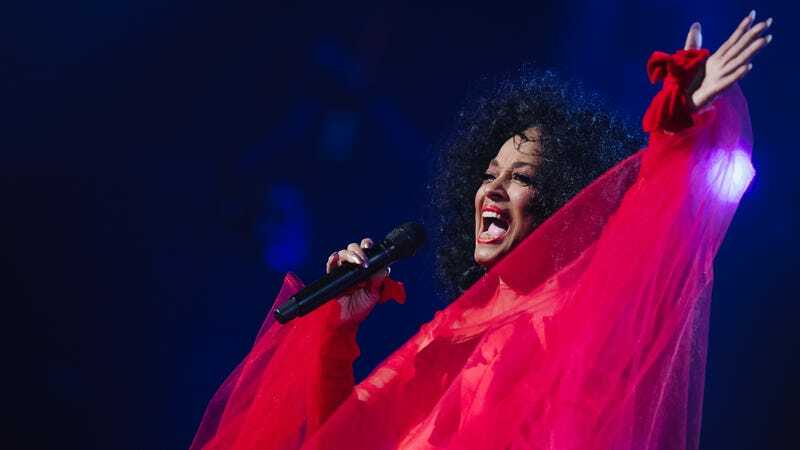 Diana Ross performs onstage at the 61st annual GRAMMY Awards at Staples Center on February 10, 2019 in Los Angeles, California. If Beyoncé sings you “Happy Birthday” (and she didn’t give birth to you), you’re probably a pretty big deal. However you may be feeling about Diana Ross these days, post-MJ comments (or Barbra Streisand, or Stephanie Mills... we’re sensing a generational trend here), it’s undeniable that the woman is a iconic diva with a legendary career—the type who draws a major, star-studded crowd when she, say, celebrates a 75th birthday. In other words, extra AF. And as usual, Hollywood said, “hold my beer.” A series of Ross-inspired lewks were on deck, kicked off by none other than our favorite fashion lover Tracee Ellis Ross, giving us Supremes-meets-Cher-realness in a feathered coral confection of a coat by Marc Jacobs over a slinky, disco-ready Versace halter dress and glittery ombré Louboutins, complete with a bowl-cut wig. We stan so hard for Tracee, we could really just stop there; but of course, she wasn’t the woman of the hour—or, in this case, the night. Besides, she get it from her mama. And only a diva like Diana Ross would celebrate her 75th birthday by headlining her own concert—and enter singing (of course) “I’m Coming Out” to a throng of screaming fans. As indicated by the “& Friends” part, Ross wasn’t the only celebrity in the building: there were Kardashians, DJ Khaled, Berry Gordy, Debbie Allen, Robin Thicke and at least one Hadid sister... and Diddy, Robin Thicke and Stevie Wonder reportedly all took the stage in honor of the Motown legend. And we can’t ignore the multiple costume changes made by “The Boss”—by our count, at least six during the night’s festivities, and each more glamorous than the next. Not that we’d expect anything less from the former Supreme, but frankly, we’re tired just thinking about it. Again: Say what you want about Diana Ross, but as recognized by the 2019 Grammy Awards, the lady is undeniably a legend. And should we be lucky enough to reach 75 looking this good, we’re probably going to be extra AF, too.